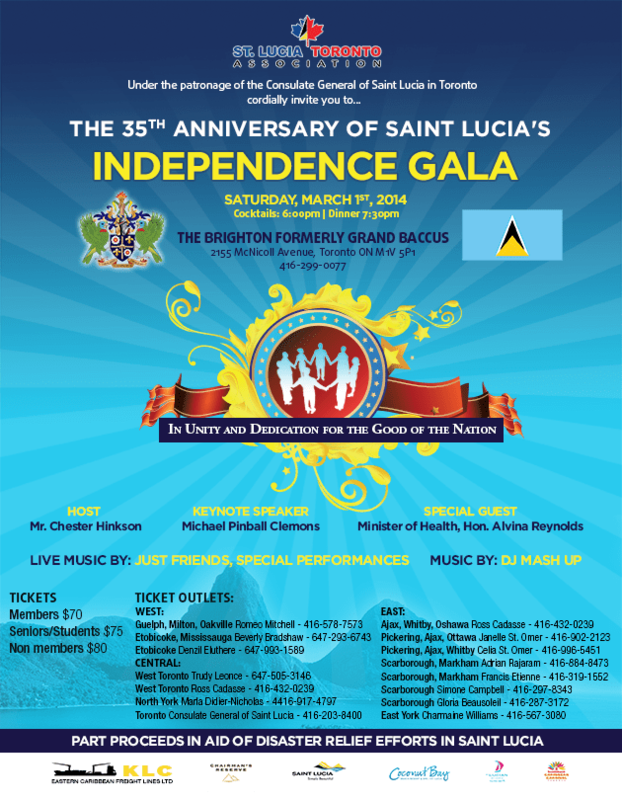 Last year I attended SLTA’s annual St. Lucia Anniversary Independence Gala with my family, and enjoyed the food, the speeches, the St. Lucian arts showcased, the dancing and the socializing. 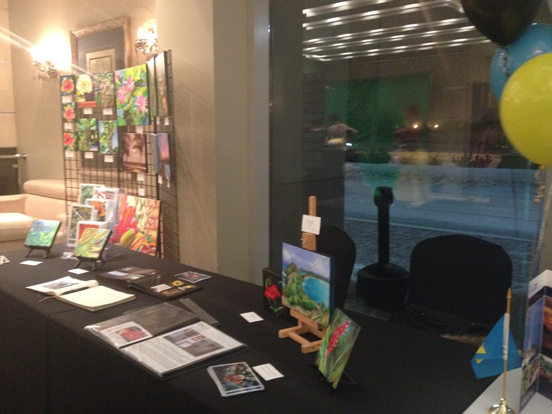 This year, I was invited to display my paintings in the foyer, so it was a very different experience as I spent most of the evening next to my work. However, it was still a great night & I’d like to share some of my highlights with you. I first met Ursuline at the Gala in 2000, it’s one of those “it’s a small world after all” experiences. It all started when I received a call from Laura at the St. Lucia consulate in Toronto, she had seen my work somewhere and invited me to her office in Toronto to show her my portfolio. She ended up buying 2 paintings, commissioning 3 more, and introduced me to Heather, at the St. Lucia Tourist Board in Toronto who then invited me to have a week-long exhibit in the rotunda at Toronto City Hall. I mention Laura, because I met her at the Gala on Saturday – I haven’t seen her in over a decade as we both traveled and raised kids etc. I think it’s interesting though that both ladies have been on my mailing list since I started putting one together. Laura was only a couple years older than me, but her investment in me & my art was significant because it showed me that I had something of value to share with the world. Of course any income made was re-invested in my business, and a big chunk of it went towards my Best easel. I’d read somewhere that an easel like that is an everyday reminder to yourself and the world that you are a professional artist and you take your career seriously. I still take great pleasure in knowing that I earned it with my art. Anyway, one day when I was in City Hall sitting the exhibition, I found out I was invited to a Gala that night. So at the end of the day, I walked over to the mall & bought some slightly fancier clothes – funnily enough it was a white top and black pants, so I guess my dress-sense or lack of it hasn’t changed. Then Laura, Heather, the Consulate General of St. Lucia in Toronto at the time (who was driving) and his wife, picked me up & took me to the Gala. It was a whirlwind, but I do remember being asked to say a few words, and standing up in front the crowd and winging it. Those are the best speeches though, the adrenaline rushing, you speak with passion and you’re a breath of fresh air in between all the dry political speeches (no offense to any politician who may be reading this). Afterwards, I met a lot of people, but Ursuline stands out in my memory for two reasons. One was she introduced herself as a friend of my Mom’s – either she or one of her sisters was my mother’s classmate in St. Lucia. And the other was that she commissioned a painting. I was experimenting with madras fabric patterns in my work and the painting I did for her was of a banana tree framed with the madras fabric pattern. Normally I don’t talk about collectors, because I figure they’d prefer their privacy, but in this case I’m writing about these women because I know they won’t mind, and because I want to acknowledge their support. 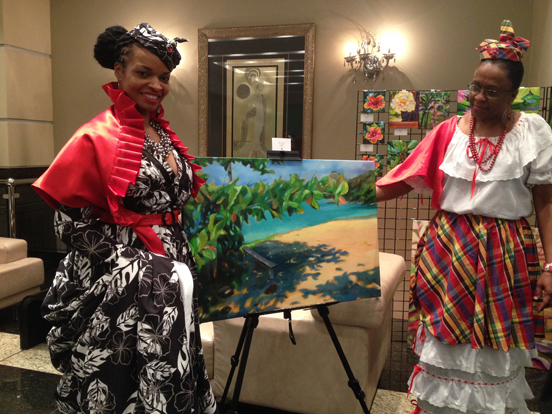 Ursuline is now the proud owner of the first painting by a St. Lucian artist exhibited in the annual international exhibition of the Société Nationale des Beaux Arts at the Louvre in Paris, France in 152 years. I was too busy to take photos during the cocktail hour when this foyer was jam packed with people in their formal wear, but it was never completely dead, and it was during one of those quieter moments when I was able to have a conversation with Gerald Paul from the Caribbean Camera. I don’t know if anything will come of the interview, but I did really appreciate the opportunity to talk about art in a deeper way than I would have been able to otherwise. Meanwhile outside, the snow kept falling! As if to remind us that we’re not in the land of hibiscus and tropical sea breezes, the snow did not let up, making the packing up and the drive home a little tricky. I see Michael Pinball Clemons now on the left of this photo, but I didn’t notice him when I was there. I heard his speech was good. 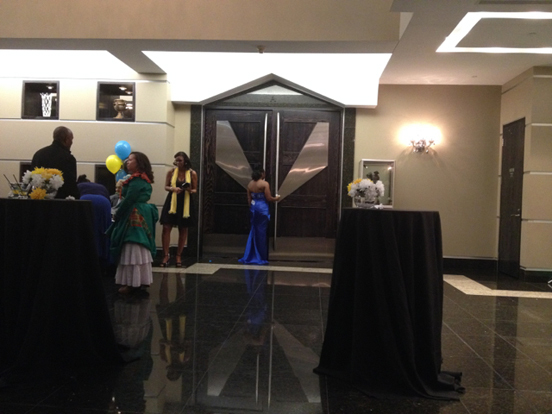 The funny thing about hanging out in the foyer was that during the quieter moments, I had a chance to meet a few people one-on-one & it wasn’t until I got a look at the program later that I realized they were giving speeches and receiving awards that night eg. Che Emmanuel with his knapsack project. And given the fact that the only other women in pants there were the servers, it’s not surprising that the guy who I thought was a Canadian investor and turned out to be a Toronto Mayoral candidate (John Tory), thought I worked there! Note to self for next year – lose 50lbs, buy fancy dress, hire someone to sit with my paintings so I can go inside & party! 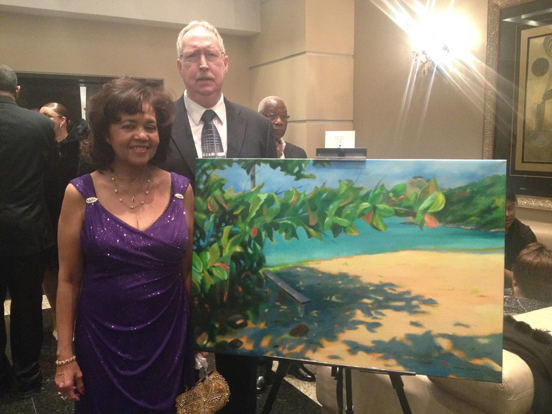 I donated a painting as a prize for the raffle to raise funds for disaster relief efforts in St. Lucia. 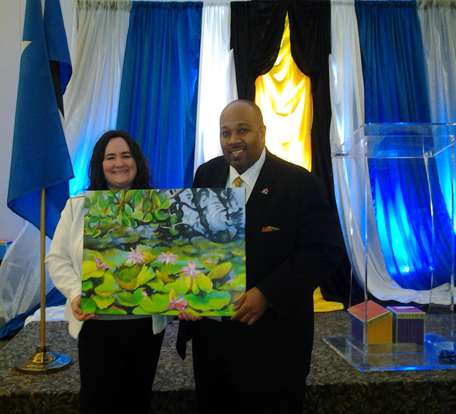 I was moved by the images circulating on Facebook after the 2013 Christmas Eve flooding in St. Lucia, people stranded in town overnight, property damaged and lives lost … so when SLTA president, Ross asked if I would donate a painting, I thought it would be a good idea. The winner, Lisa Banks, was not present, and so Ross accepted on her behalf since they work together. I’m not sure how much was raised yet, but hopefully it was significant. 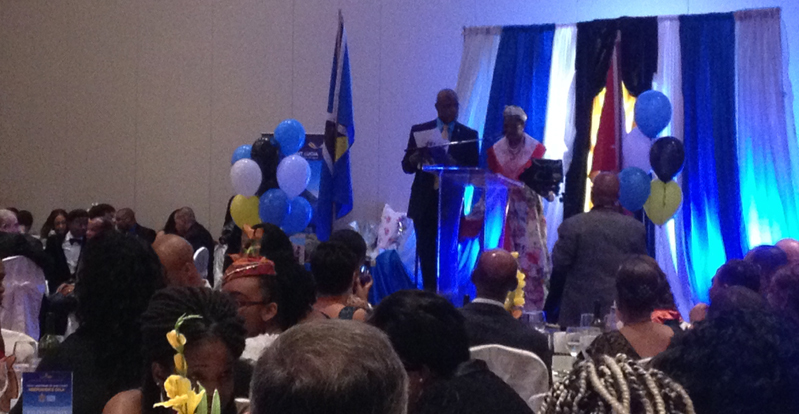 Thank you to the St. Lucia Toronto Association for inviting me to display my art at the Gala. Thank you to chef Victoria Alexander of Ti Kay La Foods and guest performer Felix “Tricky” Fontenelle for making sure I had dinner. 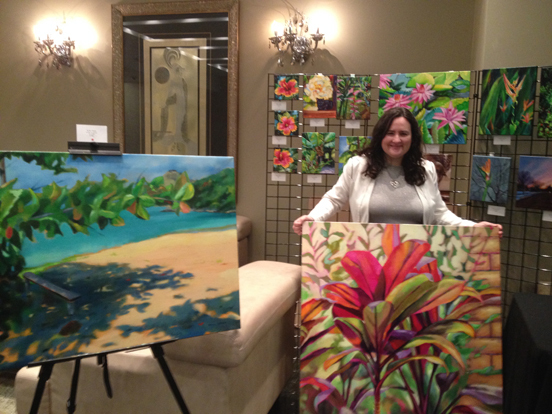 A big thank you to Ursuline and Ross for investing in my art and making my night! And of course, thanks to my family for putting up with the quirks of my artistic life … like coming in at 4am from an event in Toronto. Previous PostSt. Lucian Arts Showcase in TorontoNext PostFresh new painting for Spring!